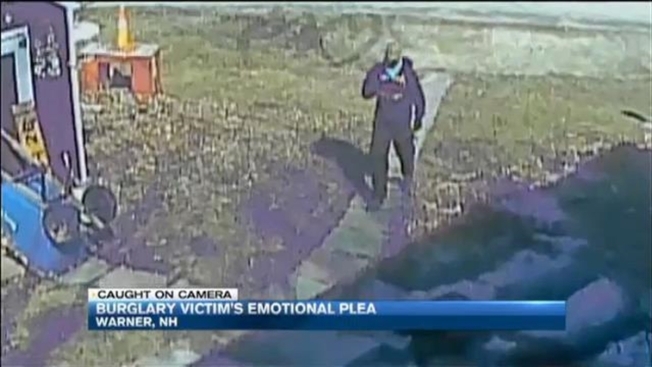 A burglar caught on camera in Warner, New Hampshire, made off with prescription drugs and electronics, but the victim says it's an inexpensive ring she misses the most. "I miss him a lot," said Rosalie Forsey as she looked down at a photo of her late fiance. Forsey and the man, who she calls Steven, were supposed to get married. "He was a very big part of my life," she said. But as the two were planning their wedding, Steven was killed in an accident at work. Forsey still has his hat, but her most cherished possession is now gone. "The ring Steven gave me before he died," she recalled. Last Thursday, security cameras captured footage of a man kicking down her front door. Police say the suspect left and came back an hour later. He stole her engagement ring, a TV and a tablet, but Forsey believes he was after her prescription pills. "The amount of violation you feel when somebody has been through your home, I don't know anybody that can have that inside them to do that to another person," she said. Forsey installed the cameras after someone broke into her home two years ago on Christmas Day. Warner Police say two suspects arrested in New Jersey on separate charges to have some of Forsey's items in their posession. The investigation is ongoing, but Forsey believes if Steven has anything to do with it, she'll get her ring back. "I know he knows how much it meant to me," she said. "I honestly believe he is watching out all the time." New Jersey State Police arrested two New Hampshire residents for weapons and drug possession over the weekend. Authorities say Troy Gagnon of Nashua and Sloane Page of Henniker were found with prescription drugs, cocaine, marijuana, an assault rifle, a handgun, and ammunition. Police say it was all stolen property worth more than $18,000. The two are being held on $250,000 bail. Warner Police believe these are the suspects involved in last week's burglary at Forsey's home, but will not issue an official confirmation.